← Google+ will die, because Google already owns the one lifestream that matters. I was reminded of the recent story about recovering an Andy Warhol project from the Amiga – see, e.g. http://www.nydailynews.com/entertainment/music-arts/new-andy-warhol-art-found-old-floppy-disks-major-hunt-article-1.1768884. How much harder from now will it be to recover a 30-year-old art work from, say, VoiceThread? Great point. It’s profoundly odd that we have ubiquitous low-cost storage, and yet we seem to be moving closer to transience. Incidentally, I was setting up a new desktop this weekend and I realized that I still have hard drives in my closet from the 90s. They are pre-SATA but apart from that, I think they’d spin up today if I wanted. Strange to think about. I am starting to understand your return to the OS ethos, but isn’t something like LAMP, or some other space that might even be more user friendly, kinda like your operating system for the web. Operating systems were hard to use once, but they got easier, and I would imagine it’s all right if folks struggle a bit with managing their server because more and mroe the distinctions ebtwen an OS and a server will start blurring. I guess the whole push on how hard things are still misses the point that they aren;t nearly as hard as they were, and that has been the trend. Also, how does this vision move beyond ownership of an application and to the question of sharing from peer-to-peer, do we return to models like Napster and Kazaa? Does that somehow reinforce the death of the web as a space to share and commune? Napster/Kazaa is exactly the model, but with storage and some processing in the cloud. We never delivered on the promise of Napster, frankly. I like the idea of Napster because it combines individual ownership and control with a central index and community. The central server negotiates a connection and then passes the work off to the peers. (This is how appear.in works as well). The Napster server pushes you together but everybody has their own copies of stuff, the service goes down you still have everything. The only problem with Napster is that you needed huge bandwidth over short periods of time, which is expensive to do from your house, and you needed to always have your computer on. OK — so put the storage and the bandwidth up on your own server, and keep the app on your laptop to manage it. As a matter of fact, this is sinilar to what a lot of torrenters do right now. Federated wiki is this idea too — we work together, but the problem is when I contribute to a group wiki I’m suddenly beholden to this organization. All that work I spent is now controlled by others. Say you edit hundreds of articles on evolution on Wikipedia. Now the site is being taken over by fundamentalists and you’re wasting your time rolling back edits. The current solution is the Slideshare solution — hey, look, you can copy and paste your stuff into some other site. Well, hold on a minute. Why should *I* have to move? In federated wiki no one can wrest control of the wiki because everyone controls their own copy. There’s nothing to take control of except your own site. I call it Tumblr for Wikis, but the truth is it’s actually Napster for wikis becuase of its peer-to-peer resiliency. The federation negotiates connection and communication, but all the assests are owned locally. Also, I’m wondering how arbitrary the distinction between Middleware and OS really is, there is a like of slippage in these terms, and I’m not convinced the OS isn’t itself Middleware when it comes to something like the Android OS. I’m working hear here, I want to really push through some of this bcause I think you’re right, but this return to the OS as an idea that one worked suggests that such a return is even possible, it’s the app-based economy that makes the constant subscriptions a reality, and with more and more OSs moving in that direction, how does one provide an advantage over the other? OK, so Android apps *ARE* middleware — that’s the point I think. They take middleware back from the web, and that’s a profound transition. The web was an excellent tool for publishing (of all sorts) and will continue to be so — but it’s lousy middleware because many years later it’s still a hack job. It’s applications built on top of what was meant to be a low security publishing architecture. Cookies are a great example of why it’s lousy middleware — Ads from searches I made on Amazon follow me to stuff I’m reading on WordPress — they can do that because of a third-party cookie structure that allows near universal surveillance on your online activity. Imagine if 10 years ago MS Word could look at all the PDFs you read in Acrobat and sent that up to MIcrosoft. Yet we have a web application architecture that allows just that. Why the frick are we building apps on this sort of platform? OK, so if not middleware, what do we need out of the web? It’s funny that you used hosted lifebits as an example in your talk, because that exactly how I see this. Imagine instead of a web site you had storage + an API. So take Dokuwiki. Instead of installing Dokuwiki, I upload all my Dokuwiki pages, plus a set of ;primitive APIs that help me make sense of that data — HTML conversions, access rights, etc. Now imagine a really lightweight Android app that makes calls to Dokuwiki and allows me to browse it, edit it, etc, all using this set of storage, security, and interpretation APIs. And imagine a browser that maybe does the same thing. It’s not that far out from what we have, right? But here’s the difference. When I buy my phone I get a storage space on the web that I can install these things too. And I go to the app store and I get Dokuwiki. I install it on my phone. As part of that installation it finds my chosen Amazon or Azure storage instance, and while it installs Dokuwiki on my phone it sets up that space that I own with the data store and the APIs. When it’s done, I go and start posting on my wiki. What does that look like to the user? It looks the same as installing the Tumblr app. But the difference is it’s *server-neutral*, and you own the web part of the installation. You probably never even go to the web back-end. You do it all from applications on your laptop or apps on your phone. It’s as invisible to you as the web backend is to someone doing Tumblr on a phone. But it’s yours. Now imagine you do this with Twitter. You install the Twitter app to your phone, but instead of using the Twitter server it says which of your registered back-ends would you like to use (stop snickering Beavis “he said back-end, heh heh”). You install Twitter on your phone. You point it to your storage,. You tweets roll up to your server, where the central Twitter server makes API calls to retrieve them. It can do this because there’s a standard back-end spec to this stuff. Twitter still gets to be Twitter. But two months later it turns out Twitter CEO was handing over the entire database of direct messages to the NSA daily. Ooops. You want to get off Twitter. So what do you and your friends do? You build a little mini app or web page that makes calls out to all your servers via the Twitter installed APIs and aggregates them, or routes the DMs. You don’t have to import to another service. You just use the software you’ve already installed. How do people make a buck then, if they can’t force you to go to their site? Here’s my crazy solution. People buy software. They pay a couple bucks for the Twitter app + server code. Maybe if they keep using the central Twitter site, they get upgrades free. maybe it’s free the first 90 days. Maybe you allow them to put a kill switch in the server code they install, but they can’t flip it if you’ve paid. I’m not sure. But that’s the vision. I don’t think it is as far off as people think. You need a storage stack, maybe on LAMP that has a generic API that could be used to build apps quickly. You could write custom LAMP API code to deal with what the server does not provide. You do this, and hosted lifebits becomes a reality. While clearly not always an answer, I do wonder why people are so obsessed with permanence rather than embracing transience. Most things *should* have a lifespan. We should embrace it a lot more than we do. By we I am probably counseling myself more than anyone. As to the real question about separation: I’m all for it. The technology is there to go back to the future with local(ish) apps and neutral storage, but the economics for the real middleman—the bandwidth—doesn’t make any more sense now than it did before. Incidentally, someone should have a hall of fame with announcements for these breakups. 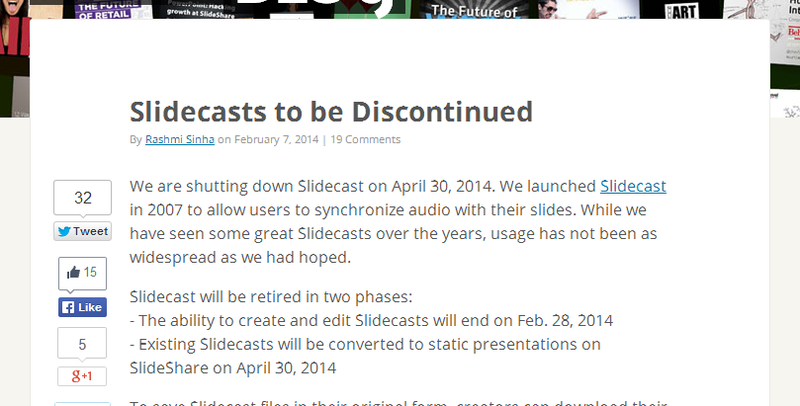 I love that Slideshare says they didn’t see the use they’d hoped when, in fact, it’s almost certain it was the use of Slidecasts that was the reason for its own demise. Sigh. Isn’t this really format as a service? and SaaS has become cunning vendor lock in? An API is software, a site is just a program in a web browser. It just doesn’t feel like software, some sort of trojan horse. Opera used to have a web server built into the browser – which I thought was cool. Imagine something like cybiko – which never got out of Russia. When online, your device is you, when offline, you’re cached somewhere? http://en.wikipedia.org/wiki/Cybiko – so here you’re effectively making a mesh network with people you like. So perhaps domain of one’s own ++, is an internet of one’s own? There’s also the Thalia (sp?) project, which Jon Udell just joined. I’m fascinated as well with the Bit Torrent Sync project, a sort of bittorrent meets dropbox thing– http://www.bittorrent.com/sync — it seems to me you could build some pretty crazy things on top of it. Read somewhere a while back about kids deleting their account when they log out of FB. They “exist” on FB when they log in, no presence when they delete and log out. Short term temporary posts? Obviously LinkedIn is not a big enough bloat to float slideshare. Cue Queen and dust biting. – but YOU WILL NEVEAR HAVE ACCESS to the videos. Eventually, after a few years, Adobe will get tired broke,, or figure out its not of financial gain, and they will do a slidecastization. Hurrah, that’s what I was searcing for, what a data! existing here at tis blog, thanks admin of this website. Thanks for finally talking about >We had a different system once. It worked pretty well. | Hapgood <Liked it!